Delcam is embracing the new era of mass customisation by applying Additive Manufacturing (AM) to the design and manufacture of custom orthotic insoles. Utilising more than 30 years of experience in subtractive manufacturing, Delcam has now embarked on integrating the increasingly sophisticated AM technology into thedesign and manufacture of custom orthotic insoles, using research conducted with customers all over the world. Delcamfirst looked at AM for the orthotics and prosthetics industry back in 2010, working with Adrian Bowyer of Bath University using a RepRap device to print custom PLA insoles. 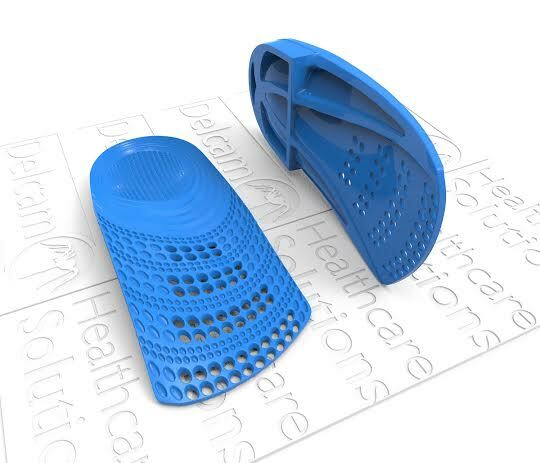 More recently, the Healthcare team has been able to transfer surface data from Delcam’s orthotics solution software, OrthoMODEL, into ArtCAM, Delcam’s artistic CADCAM package. By combining the functionality of these two software packages, Delcam has been able to generate and print a series of concept designs which demonstrate some of the possibilities for AM in the production of orthotics. The process started by creating the orthotic designs within OrthoMODEL and then importing them into ArtCAM where additional product features were added. These included structural ribs for strength, high resolution 3D reliefs for aesthetics, and textures and aeration holes for potential clinical benefits. A recent enhancement within OrthoMODEL is the ability to combine 2D images and pressure data with 3D CAD to create full ‘colour-wrapped’ 3D models. This enables the user to better appreciate the link between the 2D pressure mats and 3D scanning and make a more informed decision as to the prescribed functions of the orthotic and the locations of pads and relief. Multiple images can be wrapped onto either the 3D scans or the orthotic. Delcam is aware of a wide range of potential customers who are embracing the advances in the AM sector. The new materials and increased design freedom offered by AM are expanding the creative opportunities of designers, allowing mass customisation to be offered together with bespoke requests. Delcam is investing its resources into providing a flexible design solution for its customers. AM does not replace the faster and more economical subtractive milling but it does open some new and interesting doors. For example, by 3D printing an orthotic, the practitioner is able to design the ideal custom insole unhindered by the restrictions of conventional manufacturing.